New Delhi: In what could widen and complicate the ongoing legal spat over the supply of natural gas, Anil Ambani’s Reliance Natural Resources Ltd (RNRL) has sought the Supreme Court’s permission to intervene in a separate dispute between state-run power generator NTPC Ltd and Mukesh Ambani-controlled Reliance Industries Ltd (RIL) in the apex court. 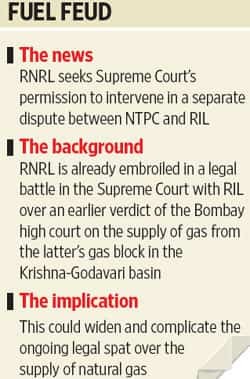 RNRL is already embroiled in a legal battle in the Supreme Court with RIL over an earlier verdict of the Bombay high court on the supply of gas from the latter’s gas block in the Krishna-Godavari (KG) basin. The RNRL petition, filed on Monday, stated that since the issues in the case filed by NTPC before the Supreme Court directly affect RNRL’s ongoing case against RIL, it should be permitted to be a party in the dispute. The lawsuit between NTPC and RIL in the Bombay high court dates back to December 2005. The dispute relates to the existence and terms of a contract between the two firms. NTPC claims there is a binding contract in which RIL promised to supply 12 million standard cubic metres a day (mscmd) for the expansion of the state-owned power generator’s Kawas and Gandhar power plants, both in Gujarat, for 17 years at a price of $2.34 per million British thermal units (mmBtu). RIL claims otherwise. NTPC filed an appeal in the Supreme Court on 5 September challenging an unfavourable Bombay high court order allowing RIL to amend its petition so as to include an earlier affidavit filed by the Union government in the same court, but in the case between RIL and RNRL. This is the same case that has now moved to the Supreme Court. In its petition to the apex court, NTPC had opposed the inclusion of a decision by the empowered group of ministers, or eGoM, in the written submission of RIL by way of an amendment. NTPC has argued that the minutes of the eGoM meeting clearly states that “The decisions taken in this eGoM will be without prejudice to the NTPC vs RIL and RNRL vs RIL case which are separately sub judice." The RNRL petition on Monday contended that RIL is relying upon the arguments employed in the RIL versus RNRL case in the Bombay high court in its defence against NTPC. The RNRL petition stated, “The interests of NTPC and the applicant are identical and the decisions of issues in one case are bound to affect the decision in the other case." However, India’s largest power generation utility NTPC maintained that its case with RIL over the supply of gas from the latter’s D6 block in the KG basin is different from that between Ambani brothers companies’ and it would seek India’s solicitor general Gopal Subramanium’s opinion. While R.S. Sharma, chairman and managing director, NTPC declined comment, a senior NTPC executive who did not want to be identified said, “They (RNRL) want to make use of this opportunity. We will answer it when the matter comes up for hearing. Our stand has always been that we have nothing to do with the fight between RIL and RNRL. We will fight our case on our merits." Similarly, another NTPC executive, who also did not want to be identified, said, “RNRL is trying to complicate the case. We are surprised as our case is completely different. We have always been maintaining this and will continue doing that. Our case is restricted to the performance of the contract and the petition is related to the chamber summons." The Anil Ambani company is seeking rights to 28 mscmd for 17 years at a concessional rate of $2.34 per mmBtu, citing a family memorandum of understanding (MoU) based on which the Reliance group was divided between the two brothers in 2005. RNRL’s plea for gas at the lower cost is based on an NTPC tender offer in which RIL, in its winning bid, had offered to sell gas at the lower price. RNRL has sought the apex court’s intervention in a special leave petition for immediate supply of gas. RIL, in its affidavit, has opposed this, saying the price is 44% lower than that mandated by the government and that it cannot supply gas at a price not approved by the government and to a user not listed in the government’s gas utilization policy. An external spokesperson for RIL did not respond to Mint’s query at the time of filing this story.